to contribute to a long-term regional and continental information system on drought and desertification – from R&D to CB activities. Implementation of an Information System on DLDD through a web-based platform. The final beneficiary of the EUROCLIMA Programme is the Latin American community, which will profit from the increased capacity of Latin American institutional partners in managing natural resources at the continental level. Therefore, most of the technical activities are implemented directly by the JRC in close collaboration with local institutions. All the information produced will be made available to interested parties through scientific meetings, workshops, publications, the web-based information system and the increased expertise of the involved national organisations. Data collection, harmonisation and analysis are ongoing activities that are promoted throughout the Programme, as new data can at any moment be added to and modified in the final information system. 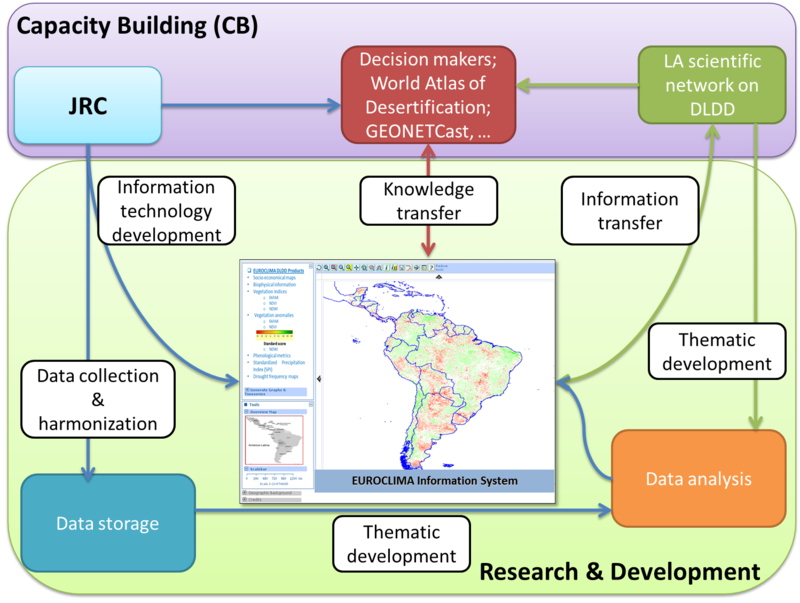 The continental-scale products will be proposed and prepared by the Climate Risk Management Unit, but the Latin American scientific community and stakeholders are expected to provide feedback on their quality and usability, in order to increase the added value of the system. A subsidiarity principle characterises the overall approach to the information system: decentralised information, i.e. national data managed and maintained by national Latin American partners, but accessible through a common web-based platform. 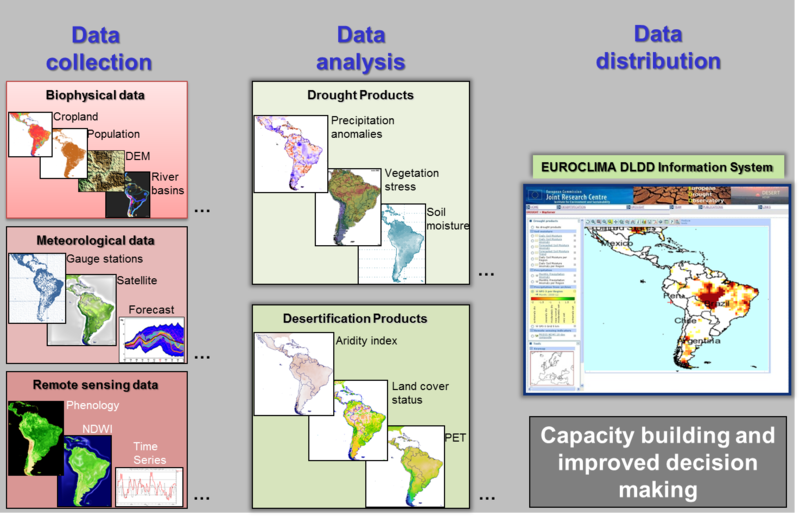 The idea is to use the data provided by Latin American national institutions in the establishment of specific and representative case studies from local to national scales, to compare indices derived at the national scale with information derived at the regional and continental scales, and to improve the whole database of the Latin American DLDD scientific network. The DLDD Information System is expected to be a dynamic structure. The web-based platform will be developed by the JRC, but in the longer run it will be transferred to and coordinated by Latin American institutions. To meet the challenge of integrating multivariate data from multiple sources, one needs to deal with complex information and a related diverse and expanding set of tools to handle it. Because drought, land degradation and desertification are multivariate, multi-scale and dynamic processes, the information system will include advanced interactive tools, such that every end user can analyse the online data and extract valuable information from the system for his own purposes.